Moscow blogger Dmitry Berdasov creates a photo project Metro 365, where he unveils his photos of the subway. RBTH talks with Dmitry about his blog and his favorite stations. Dmitry Berdasov is a Muscovite. Having ridden the subway since childhood, he has refrained from descending below for 12 years. This, according to Dmitry, is perhaps what preserved his interest in the Moscow Metro, which he now photographs for his LiveJournal (LJ) blog. 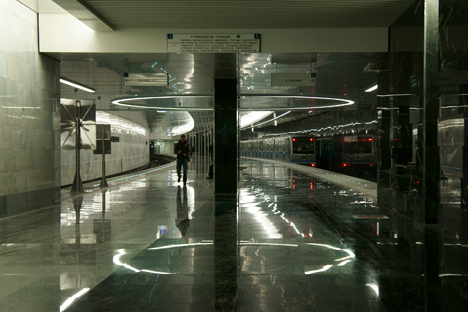 The Metro 365 project is an LJ page that Dmitry uses to unveil his photos of the subway. The plan is to cover all 188 stations in the space of one year. In conversation with RBTH, Berdasov talks about his favorite stations and issues advice to tourists about which of them to view first. Russia Beyond the Headlines: Why did you undertake this project? Dmitry Berdasov: It was the start of the fall and there was nothing to shoot. I decided to take pictures of the subway. First up was Slavyansky Bulvar — that's a neat station. Then LJ announced a series of project grants, so I came up with Metro 365, and I got a grant to develop my blog. By that time, I had already photographed 15 stations and was beginning to understand what sort of organisms they were and how they were arranged. RBTH: Is there some kind of system to subway stations? D.B. : In principle, all stations, new and old, are divided into two groups: deep and shallow. Those with shallow foundations have column footings, known as "centipedes," but deep stations can have column or pier footings, which are thick walls with openings in them. RBTH: Which stations should foreigners head to first? D.B. : I would suggest the brand new ones — Pyatnitskoe Shosse, for example, which is finished with black and white marble and is one of six stations in Moscow with a concave platform. Mezhdunaradnaya is interesting; it goes straight to Moscow City. As for the old, pre-war stations, I recommend the red line from Park Kultury to Sokolniki. One of my favorites is Elektrozavodskaya, built during the war — a pier-footed station in the Soviet style, with portraits of academics and figures of soldiers, farmers and construction workers in white marble bas-reliefs. I also like Victory Park: It's new and employs different colored marble. There's a bright mural panel dedicated to the Patriotic War of 1812 at one end of the station, and another to the Great Patriotic War at the other end — both created by painter and sculptor Zurab Tsereteli. Many of his works adorn Moscow, such as the monument to Peter the Great and the Cathedral of Christ the Savior, which he oversaw. His sculptures are on display in Alexandrovsky Garden, which seem to get a fair amount of verbal abuse. Incidentally, you can also view his work at Trubnaya station: He designed the stained-glass windows and colored panels with churches and cathedrals. At Taganskaya station on the Circle line, the blue arches on the walls are made of porcelain, and the walls themselves are ceramic. There used to be a large statue of Stalin surrounded by military personnel. Of the "pre-perestroika" stations, I'm fond of Nagatinskaya on the grey line, with its marble, Florentine mosaic along the trackside wall. RBTH: What subway legends have you heard? D.B. : The Internet is full of them, but no one knows if they’re true or just conjecture. From Kuntsevo, where Stalin's dacha was situated, there is indeed a subway line to the center — that's not a legend. Some spans of track also have flooring to accommodate cars as well as trains — anything's possible in the Moscow Metro. RBTH: Have you started using the subway again? D.B. : After June 15, when everyone goes on vacation, it will be possible to travel by car; but, otherwise, the subway really is the quickest mode of transport in Moscow. It’s a time-tested way of getting from A to B on time. For guests of the capital, it’s a tourist attraction in itself — all foreigners want a glimpse of the Moscow Metro.